We set off for the Mekong Delta this morning with an organised tour group. We figured that joining an excursion was the best way to cover a few areas within the Mekong, in a short space of time. 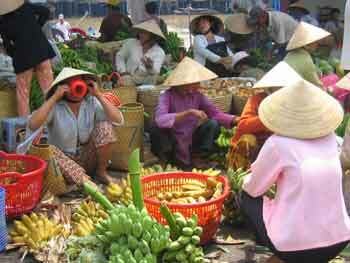 There are many cheap deals offered by many of the tour companies along Bui Vien Road in Ho Chi Minh. To be honest, they are all much of a muchness and seem to offer variations on the same itinerary at similar prices. The Mekong Delta is best known for rice-growing. It is often referred to as Vietnam's rice basket. It produces enough rice to feed the whole of Vietnam with superfluous amounts to export elsewhere. Vietnam has become the second largest exporter of rice worldwide, after Thailand. That's one big rice basket! Our first stop was My Tho City. We literally got off the bus and straight onto a motorboat that took us on the Bao Dinh Canal to My Tho Street Fruit Market. The market sits alongside the canal and is very colourful. What struck us straight away was that all the women fruit sellers (and they were predominantly women) wore conical bamboo hats. It looked like we had been transported back in time. Unlike markets in the capital city, the fruit sellers here left us alone and didn't latch on to any of our limbs, pleading us to buy their wares. Our guide, Dong, had warned us that some of the locals may stare at us tourists as they are not used to seeing foreigners. I seemed to blend in with the surroundings, in fact, a little too well as a few stall keepers started talking to me in Vietnamese. I seem to get this kind of response in most countries in SE Asia! Hiding behind a giant-sized flask won't stop us taking your picture, lady! A few of our tour group bought some fresh fruit and one lady described some delicious banana wrapped in rice and bamboo leaves that she'd just eaten, which made me feel very hungry. Luckily it was lunchtime and we were taken by boat to Tortoise Island for lunch. We walked along a shaded path through jungle-like domain and ended up in a secluded restaurant. Apart from the restaurant, there didn't seem to be much else here. Dong pointed out that there are many longon fruit trees here. I resisted pulling some off despite feeling hungry! After lunch we moved to smaller motorboats that could squeeze into some of the tighter canals. These were picturesque waterways, lined with water coconut trees and all manner of overhanging leaves and fronds that reflected in the sunlit water. It truly felt like we were being swallowed up by the encroaching jungle and had it been another part of the world, we might have expected a crocodile to swim past. Thankfully, this is not something that we would see in this area. We would, however, be sure to see more coconut, especially at our next destination: Ben Tre. Coconut candy is a speciality of Ben Tre and we watched women boiling large cauldrons of sticky coconut mixture, rolling it out, cutting it into squares before wrapping them in rice paper and sweet wrapper for sale. We bought a slab to munch on the bus. We stopped off at a honey tea and honey wine place next, also at Ben Tre. Dong held out a board covered in bees and asked the audience to scoop some honey off using their fingertips to sample the syrup. I took a raincheck on that one - instead, I tried the honey tea and that was delicious. The honey wine, like most Asian 'wines' tasted like pure alcohol! 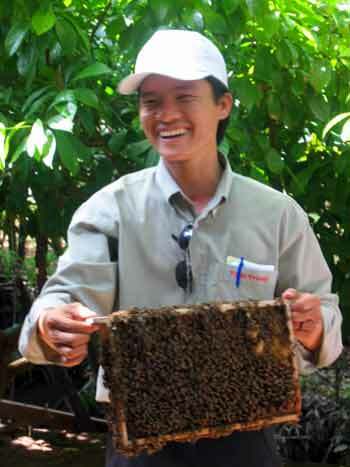 As we watched the locals sing and play Vietnamnese folk music, the bees buzzed around noisilly. Despite this, we were still able to relax in the surroundings. Maybe the wine had taken its effect! Laughing away, Dong asks who's brave enough to stick their finger in to try the honey. There was an opportunity to handle a python but we had done this before on several occasions so we continued to sit back and watch others wince and squirm waiting for their photo to be taken. Most of the day seemed to have been spent on the waterways. It was by no means the end as we transferred back on to the big boat and rode over to Unicorn Island. We walked through a large souvenir complex - again, this seemed like the only developed place that existed on this island - and straight to the row boats. Great, another boat trip, but this one had a difference - we were in costume! Cruising along the Mekong Delta in the appropriate attire. 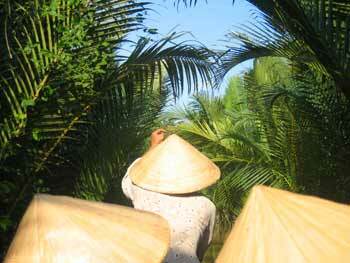 Everybody donned the traditional Vietnamese conical bamboo hats as our rowers took us down Tan Thach Canal. We watched lazilly as the surroundings slowly changed around us, eventually leading us out of the small canal back in to the main waterway. It was a pleasant boat trip in the sun and as we pulled up to My Tho, dark clouds were looming ahead. We had made it ahead of the bad weather and then, spent the next three hours on the bus watching the rain come down - all the way to Can Tho, where our beds were waiting for us.